We had bought a variety of veggies from the local market and I wanted to make a super veggie packed dinner. If we go the nepali way, either we make one item for each veggie or combine all to make a veggie curry. A and I didn’t want to have rice for dinner and making flat bread would be a lot of work. 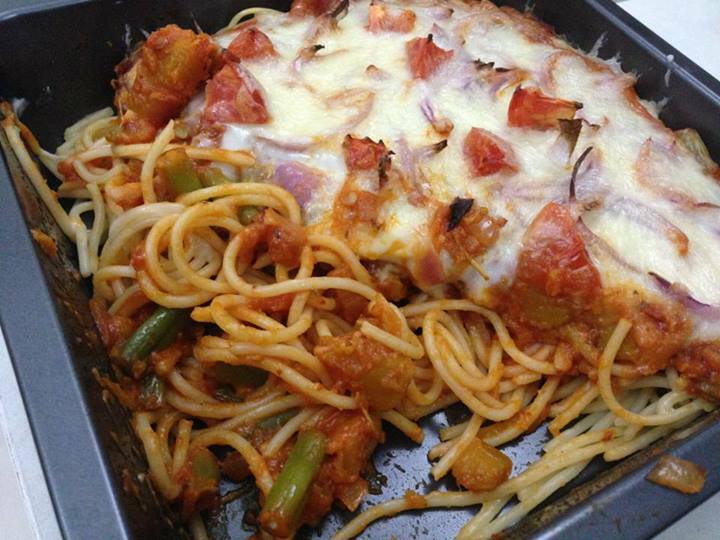 So we settled for a veggie spaghetti bake. 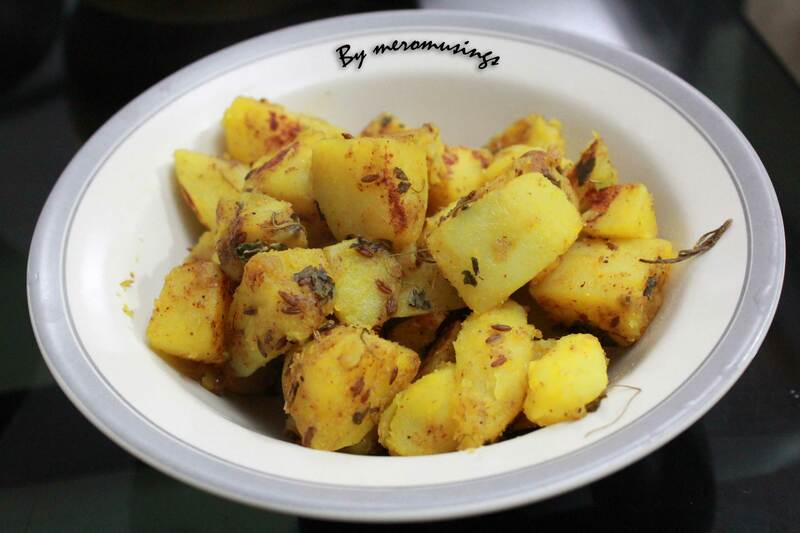 The result was quite nice and hence I decided to include the recipe here. I began by cooking spaghetti and throwing in the cleaned and largely diced pumpkin in the same pot. Once the spaghetti was done, I drained it and put french beans in the hot water and let it sit for a while. For the sauce, I fried some chopped garlic and half the red onions in olive oil first. After that I put the tomato puree in it, added some water and let it shimmer. In the meanwhile I smashed the boiled pumpkin and cut the french beans. I added all the veggies in the sauce, added oregano, rosemary and thyme along with chilly flakes and salt. I let it cook briefly(I wanted the french beans to be crisp). After that the job was almost done. I just needed to arrange it all in a baking dish. 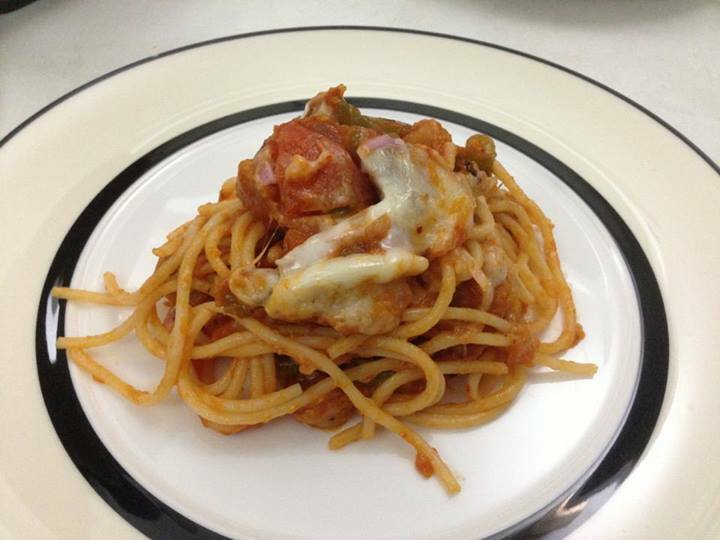 First I put the spaghetti and then went the sauce followed by a layer of sliced red onions and diced tomatoes. I grated some mozzarella cheese on top and let it bake for 20 mins. Voila! the dinner was served. It was yummy, I wish I had taken good pics of it though. Dinner Served, no salad though :P.
I made this again last night and I added beets to the veggie sauce and a layer of fresh basil leaves, it was yummier :). A and I had a wonderful weekend. We made Momos. Momo holds a very significant place in our hearts. It brings back fond memories of our childhood. I remember we all used to sit down on the kitchen floor to make momo. Each of us had our own area of specialization and we were designated for specific jobs. 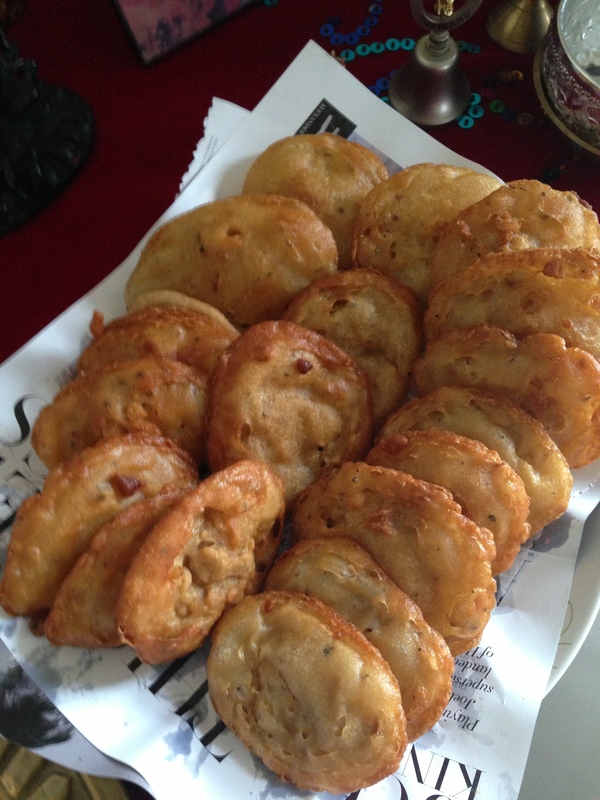 Mom took care of the steaming part and dad advised on mixing the momo mince, Kancha rolled the dough, my brother was responsible for shaping the momo and me and my sister were the ones who’d help him by putting meat in each rolled piece of dough. All of us would sit down in the kitchen floor, drink coke while making Momo, except Bua who’d drink Whiskey and if my brother got lucky he’d get beer :). Momo making binds the family together, it is the only dish that involves all the family members in its making. Today I’m sharing my version of the famous Nepali Momo. The first recommended step while making momo is preparing the dough. Mix all purpose flour with water and some butter to make a soft dough. Mix well until it is soft and flexible. Cover it until rest of the ingredients are ready. Approximately 1 kilo of dough is required for 1 kilo of mince meat. Put all the ingredients together in a big bowl and mix generously until all the spices are well mixed, if the meat is too dry do not hesitate to put half a cup of water to make it soft and juicy. For best results use your hand instead of a spatula :). 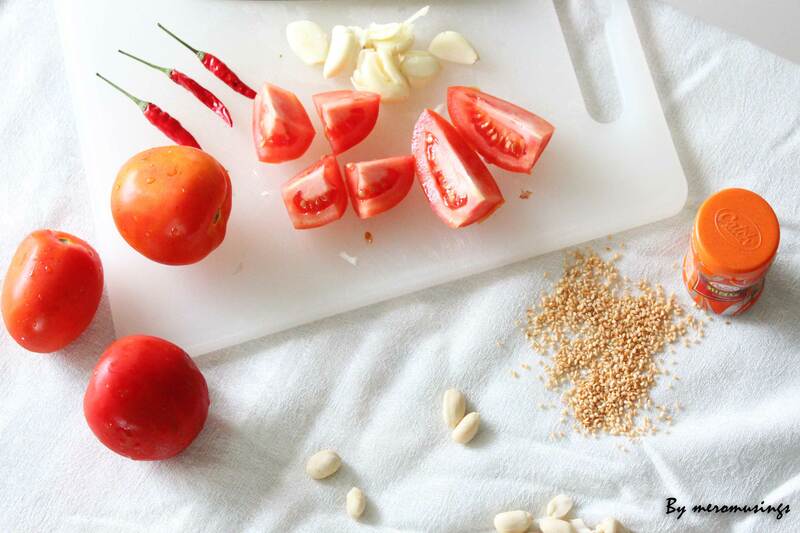 The spicy sauce is an integral part of Momo. Momo without sauce is like sweet tea without sugar! My idea was to make one hot spicy sauce and another mild and sweet sauce, so the red sauce is hot and spicy while the white one is more mild and sweet. In a pan, heat some oil and throw in the garlic and red chillies together with a pinch of hing, then put the tomatoes and cook until it is slightly (around 80%) cooked. 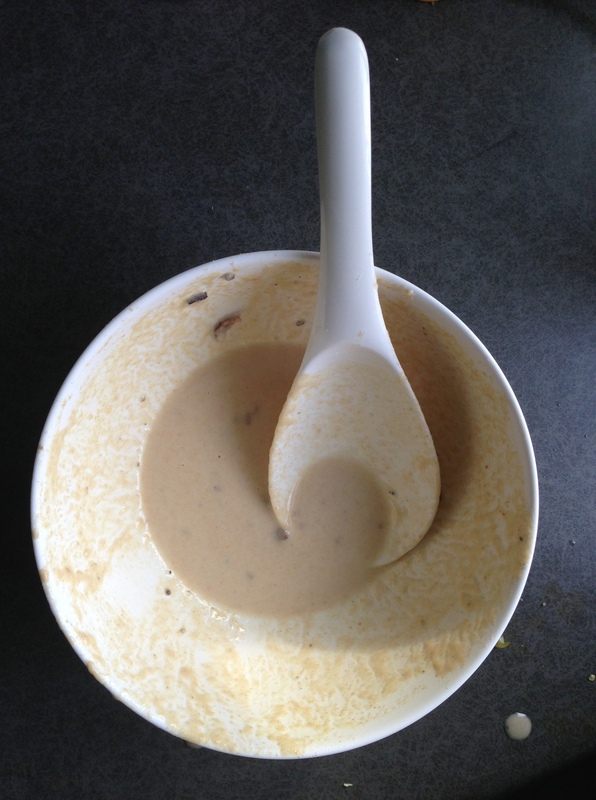 After that let it cool for sometime and put the mixture in a blender to blend into a sauce. 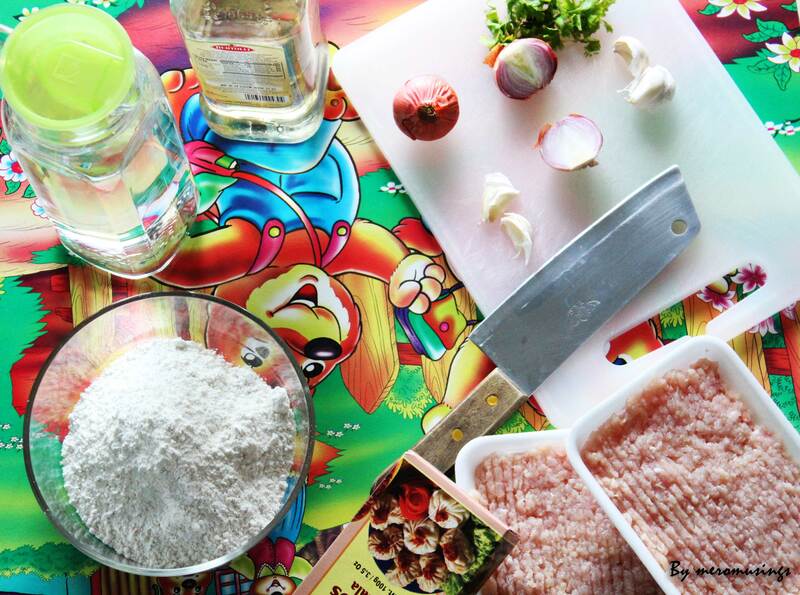 Serve chilled over hot Momos. 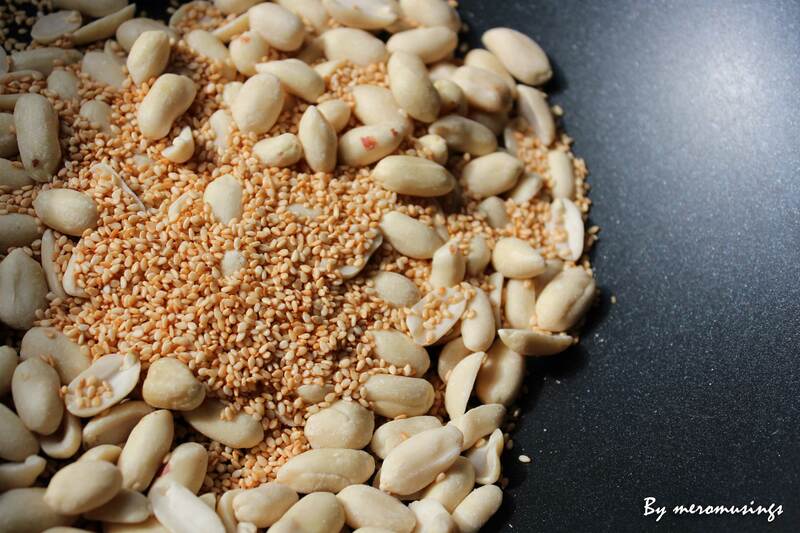 Roast the peanuts and sesame seeds together in a pan until golden brown. Set aside until it cools down to room temperature. After that blend the roasted sesame and peanuts with garlic pods and water to form a thick sauce. After that add lemon juice and honey before serving with hot Momos. 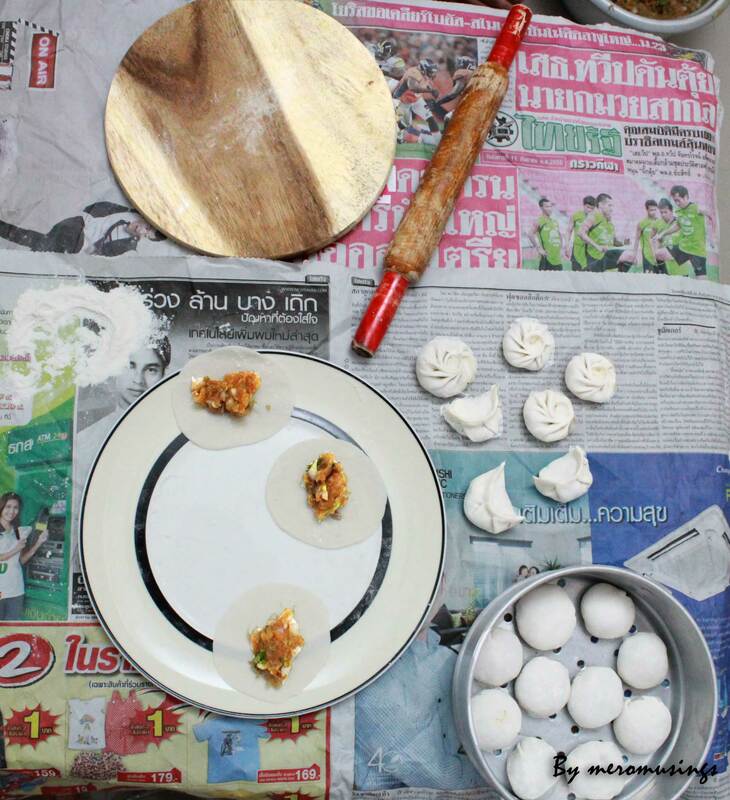 Make small spheres of the soft dough and roll it to obtain a circular roti. Use some leftover flour so that the dough wouldn’t stick when you roll it. Then use a fork to put some mince meat in the roti and shape it according to your preference, half moon and circular are the most famous momo shapes. Use your left hand thumb to press the meat and use your right hand to pinch the flour to fold and make a plate. Continue to fold and pinch in circular way as you rotate the dumpling in your palm. If you can’t get the shape right on the first time, don’t worry much, the basic idea is to cover the meat with dough and seal it so that it will be well cooked and the juices will remain intact. After this, oil the base of the steamer and place the dumplings. 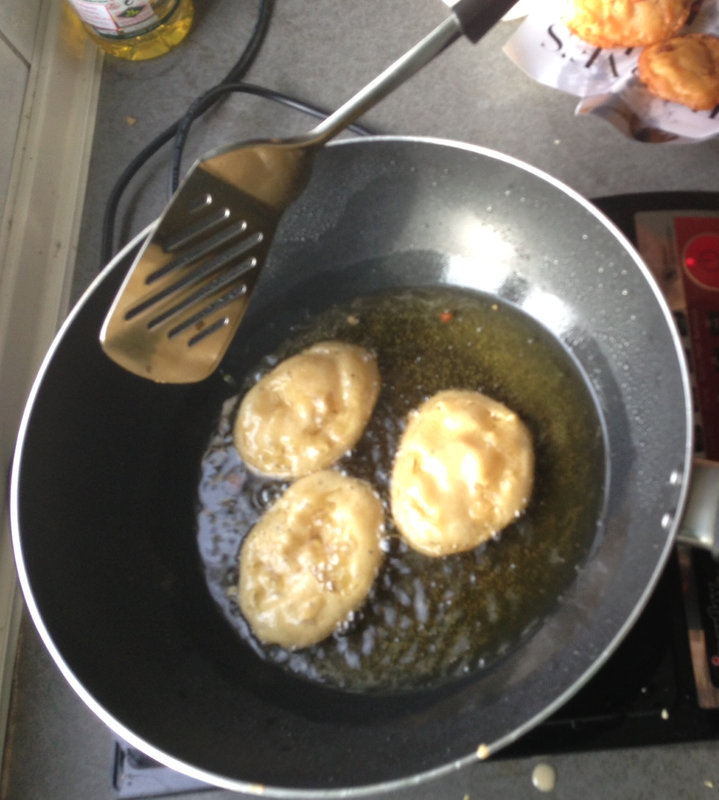 Place the dumplings upside down so that it won’t break after its cooked and the juices remain intact. Steam it for about 10 mins and your delicious hot Momos are ready :). Serve it hot with the Red and White sauce. Making dinner plans at work always brings a smile on my face in anticipation of the wonderful food filled evening that follows. 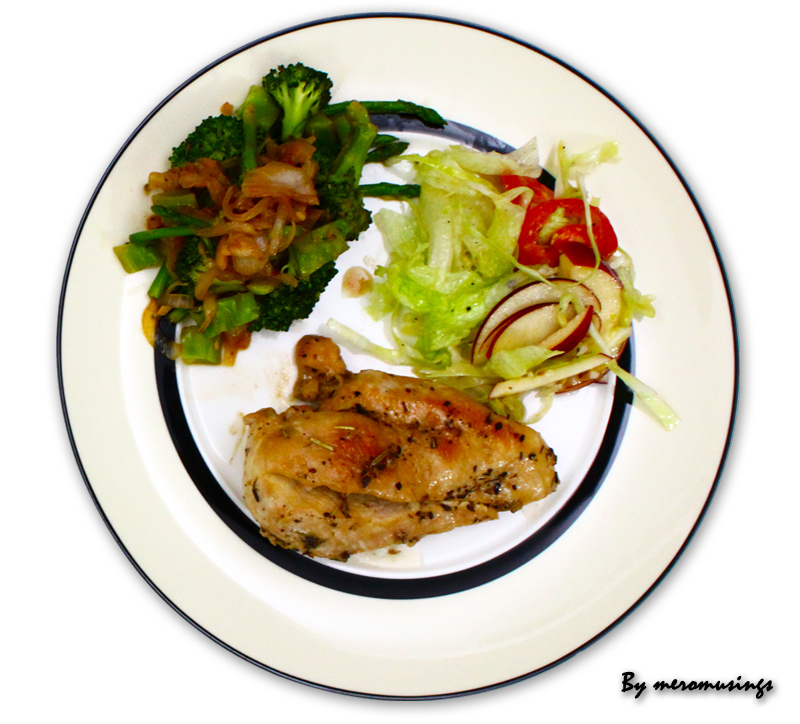 Today, A and I decided to have chicken steak for dinner. Soon after the work hour was over, I laid out evening plans to A. We were to go together to the market, where I’d buy chicken, vinegar and salad. After that A was designated to go to the local market that opens on Wednesdays to buy some veggies that would accompany the chicken steak I was going to make for dinner. I started by marinating the chicken breast in olive oil, apple cider vinegar, soy sauce, salt, pepper, pods of crushed garlic along with rosemary, thyme and oregano. I love the aroma of Italian herbs. Then I prepared olive oil, apple cider vinegar and garlic dressing for the salad. I pan fried the chicken over low heat along with all the juices used in the marination, so that it would be soft and juicy. In the meantime A arrived with veggies I requested for. I let the chicken cook in low heat for around half an hour turning it once or twice. After that I tossed some broccoli, onions, asparagus and chopped garlic in the same remaining oil in the pan. 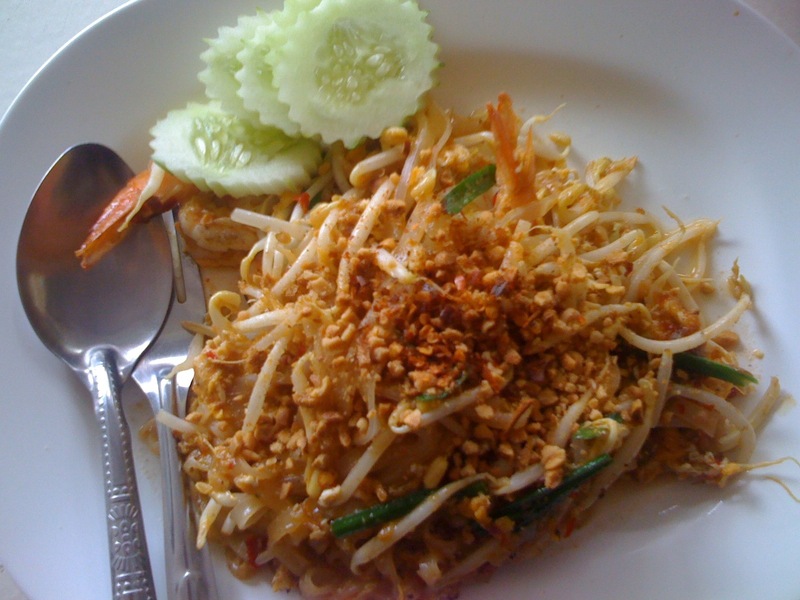 After the veggies were done, it was time to enjoy the dish. We missed the wine though, as we didn’t have any left at our room and forgot to buy it at the market. 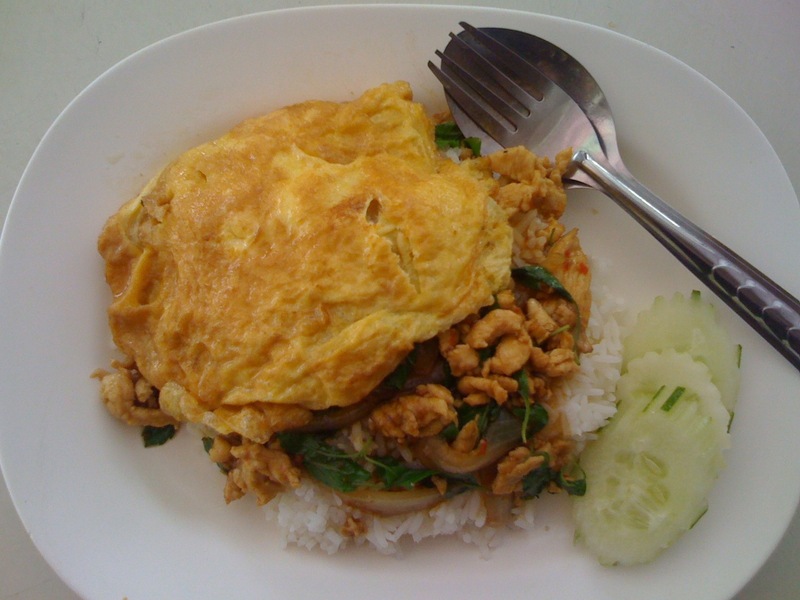 Nevertheless the cooking was successful, A and I enjoyed the juicy soft chicken a lot :).